PASADENA, CA; February 1, 2019 — Today at the Television Critics Association Winter Press Tour, PBS and Vox Media’s Eater, the leading lifestyle network focused on food and travel, announced that NO PASSPORT REQUIRED, hosted and executive produced by renowned chef Marcus Samuelsson, will return for a second season this fall. Once again, Marcus will explore six different American cities, visiting with both professional chefs and home cooks, for an in-depth look at the rich diversity of immigrant traditions and cuisines woven into American food and culture. This season, NO PASSPORT REQUIRED will travel to Houston, home to one of the highest numbers of West African expatriates of any U.S. city; the Filipino American community in Seattle, who are part of the city’s longstanding Asian Pacific American heritage; Los Angeles, where the world’s second-largest Armenian community resides; and Boston, where Marcus explores Portuguese-speaking cultures and cuisines from three different locales: Brazil, Cape Verde and Portugal. Other episodes focus on the Chinese American community in Las Vegas, which has grown tremendously over the last 20 years, and Philadelphia, where Italian Americans have thrived for generations. In each city, he’ll visit local restaurants, markets and family homes, learning about each community’s cuisine and heritage. 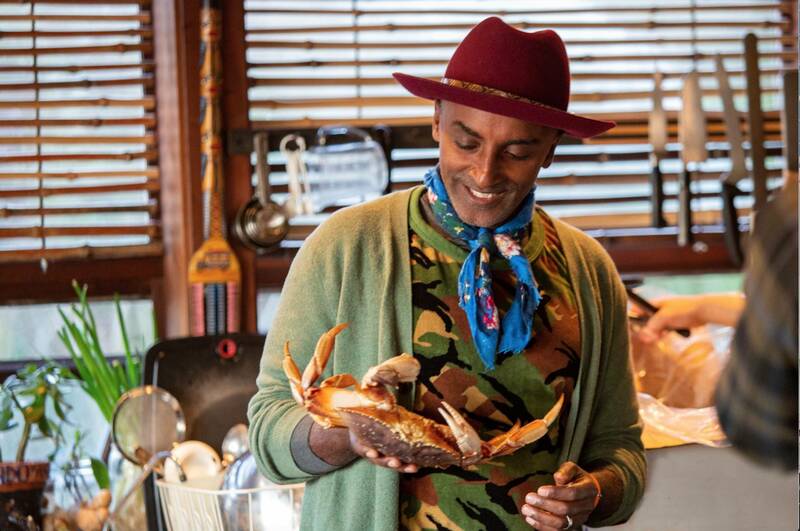 An immigrant himself — born in Ethiopia, raised in Sweden, now a celebrated chef, restaurateur, author and resident of Harlem — Marcus Samuelsson is passionate about sharing and celebrating the food of America’s vibrant communities. Each episode shows how important food can be in bringing Americans — old and new — together around the table. “NO PASSPORT REQUIRED was one of our freshest and most popular new shows last year,” said Pamela A. Aguilar, Senior Director, PBS Programming. “It included new perspectives and provided a unique lens that brought younger audiences to PBS, who connected with Marcus and the culture and cuisine of these diverse communities. We’re delighted to present a new season of this inclusive series that is part of the PBS commitment to provide programming that is reflective of all Americans." A series of events will bring the featured cuisines to audiences in each city through recipes, behind-the-scenes photos and exclusive digital content on Eater and PBS.org, and through local outreach by PBS member stations and Eater’s local city platforms. NO PASSPORT REQUIRED is executive produced by Marty Moe, Chad Mumm, Amanda Kludt, Jim Bankoff, Joanna Forscher and Marcus Samuelsson for Vox Entertainment. Sonia Chopra is co-executive producer for Eater. Pamela A. Aguilar is the executive in charge for PBS. Vox Media is the leading modern media company known for its standout technology, high-fidelity advertising, and house of editorial networks united by a shared belief in the power to go deeper to connect with global, passionate, curious audiences. Vox Media’s brands and businesses include SB Nation, Eater, The Verge, Vox, Curbed, Recode & Code Conferences, Polygon, Concert, Vox Creative, Vox Entertainment and the Vox Media Podcast Network. Vox Entertainment is Vox Media’s Los Angeles and New York-based development, production, and distribution division for premium TV and OTT programming. In 2018, Vox Entertainment and Vox premiered a weekly docuseries, Explained, on Netflix which will return for a second season in 2019; Vox Entertainment and Eater premiered its first broadcast television series — No Passport Required — on PBS, hosted by chef Marcus Samuelsson; sports network SB Nation and Vox Entertainment premiered a true-crime sports documentary series, Foul Play, on Verizon’s go90 platform. In 2019, Vox Entertainment produced and premiered American Style, a four-part documentary series examining the impacts of political, social and economic changes on American style through the decades as a CNN Original. Eater is a lifestyle network and the most trusted voice in the food and travel space. With the only team of dedicated journalists in 24 markets across North America and the UK, Eater has been at the forefront of breaking news and goes deeper into the cities, restaurants, bars, chefs, ingredients, experiences, and stories that are shaping culture today with award-winning features, a flagship maps program and much more. In July 2018, Eater’s first foray into television “No Passport Required” premiered on PBS. Produced with Vox Entertainment, the six-part series, hosted by Chef Marcus Samuelsson, took a culinary and anthropological excursion into the cities, communities, and cuisines of today’s multicultural America. With a wide variety of original video series like “Omakase,” and “Prime Time,” the two time New York Emmy-award winning video team continues to evolve giving viewers new hosts, formats and access to experiences and destinations that redefine how food is covered in the media. PBS is the original home of cooking and still offers the very best in food and cooking. From A Chef’s Life to The Great British Baking Show to Martha Bakes, PBS programs and chefs have received more Peabody Awards, Daytime Emmy® Awards and James Beard Foundation Awards than any other network. Viewers can explore more deeply on the award-winning PBS Food site (pbs.org/food), which brings together the best food and cooking content from across public television with award-winning digital videos, recipes, articles and more.